According to its Steam description, Chaos Drift is an RPG reminiscent of certain classic titles such as Final Fantasy VI and Chrono Trigger. 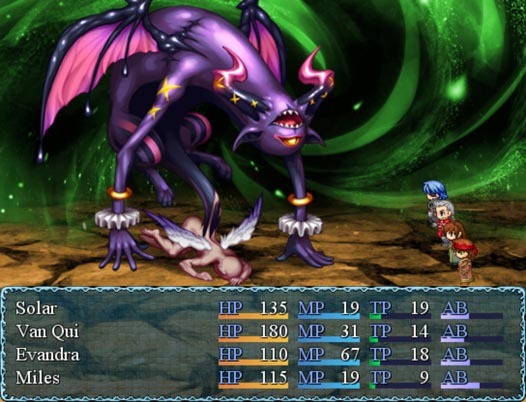 But, unlike a decent number of RPGs, Chaos's stat system features cool character customization. The intro is neat, with its somber and somewhat melancholic feel. It's pouring, there's a guy alone in a cemetery, and the music that pairs with this opening scene is dark and ambient. There are three parameters which you must mind: HP, MP (used for magic skills), and TP (used for special skills, and which accumulates during battle). I am delighted by how straightforward the developers made the character progression. After the first battle, a concise paragraph is shown, informing you of CP (character points), how much CP you gain upon leveling, what you can do with these points, and how to reset them. You’re even told that there are five of these CP reset items – the Talisman of Chaos, possessed by Solar (the main character) – and you can even find more during your journey. This takes the guesswork out on the player's side, you needn’t lament later on, Ah, I didn't allocate my points properly and want to redo this – will I have to restart the entire game, or is there still hope? Yes, don't worry: there’s still hope. When allocating these points, you can see precisely what will increase, and by how much. This contrasts with most RPGs, where stat progression is set based on class or function of the character. Additionally, boosting one stat can boost others as well, for example, upgrading health also increases defense. Unfortunately, as with magic, this result is often inconsistent – an unpleasant bug. 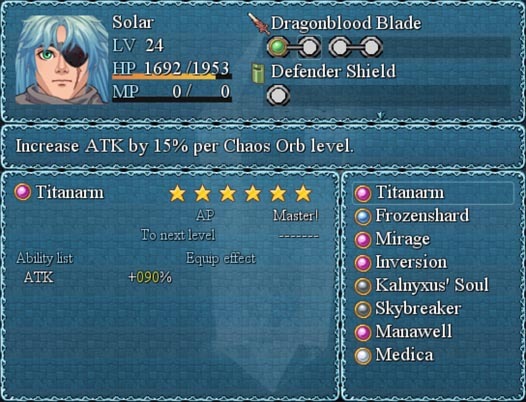 Along with being straightforward about CP and what to expect, the developers have also included a rather helpful tutorial section in-game that gives information regarding various things – from what each stat means, to how one can obtain Chaos Orbs, or what happens if one equips a new piece of gear. So long, figuring out technical details of the mechanics! This frees the player to focus on playing and enjoying the game. Upon leveling (by finding a Shard of Chaos), something strange occurs with one's DEF: it drops after leveling – mine dropped from four to three. This did not occur when going from level two to three, however. I first considered that this was due from an enemy scaling mechanic: in Diablo II, each time one levels up, if one highlights some parameter related to defense, the percentage of damage taken increases from enemies of the same level as the character. That was my hypothesis going into Chaos Drift, but one would also expect that ATK (attack) would decrease if this were the case, but ATK remained the same. Additionally, at level two, if I invested a point into the Power parameter (having already invested two thus far), it shows DEF remaining constant, so one would expect the value to remain the same after investing another CP; yet, investing a CP brings the value up to four. I notice this occur with other stats as well, such as with ATK. I am unsure if this is intentional (and there are hidden stat increases that take place) or not, but it needs tweaking. I find the system itself refreshing, as I scarcely find it in the other RPGs I have played, but the execution may need some finessing to function as originally imagined. This also makes it difficult to plan out a build for the character, as the stats behave unpredictably upon leveling up or investing CP. Additionally, certain actions produce a slight delay, such as when retrieving a hidden item from a drawer, although this is not severe. Aside from this, the save points need modification – yes, they will heal the character, but you must wait ten minutes after healing to heal again. Given the support that Tull grants, I have only healed at this fountain once – never needed to after that, although I did use a few potions on a boss fight. You also gain AP value after each battle, but I can’t figure out why. It doesn’t seem to be for leveling up, as there is no apparent XP bar; nor is AP value found in the menu – there, you’ll find only your money. It isn’t until Solar reaches the house that AP's function becomes clear – it's used to level up a socketed Chaos Orb, which provides some benefit to the character or grants access to some spell. With each level up, the strength of the skill or benefit increases. The dialogue, however, is splendid, and gives the characters in Chaos Drift some depth. Their personalities come to light in certain scenes, such as when Solar tells Ellie that it is perhaps best that she doesn’t remember a thing. He actually says this because her amnesia is conducive to her safety (in the aside, he remarks to himself that he will simply tell them that she is dead), but she takes this comment as rude and storms off. 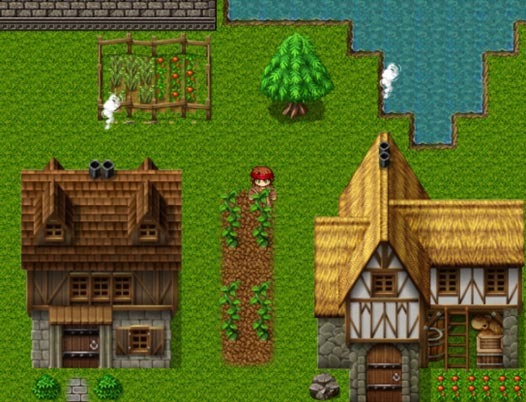 The player can get some insight into each person's perspective. The music is also great, especially in the caves, where the general tone is haunting with a tinge of being eerie. Given the current state of the stat system, there is a definite need for some tweaking; and this is desperately needed in light of the game's description on Steam, which mentions this customizable stat system. This drew me in, but high expectation quickly gave way to disappointment as my head began to spin, trying to make sense of what was going on with the stat system. I cannot recommend this game with good faith until this is fixed, especially given the fact that it is such an integral part of a typical RPG.